The Town of Kingston is located on the west side of the Hudson River about 50 miles south of Albany and 90 miles north of New York City. It is bordered by the towns of Woodstock, Ulster, and Hurley. It has a population of about 900 people. The historian post office presentation is on WEDNESDAY, April 24, not Thursday. Tai Chi for Arthritis is coming to the Kingston Town Hall in April. recycling. Please do not put plastic bags or foam cups in the recylcing bins. Click here to add your cell phone or email to the Town of Kingston Swift911 notification system. 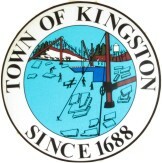 Click here to receive Town of Kingston email notifications. Website Disclaimer: The Town of Kingston is providing information on this Web Site as a public service for reference purposes only. Official information is in the Town of Kingston Offices. Although we try to be as accurate as possible, the Town of Kingston makes no claims, or guarantees as to quality, content, or accuracy of the information on this website.